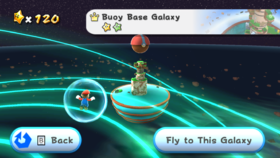 The Buoy Base Galaxy is a galaxy that appears in Super Mario Galaxy. The galaxy contains a large fortress floating atop a large, semispherical pool of water. Mario has to climb this fortress in order to get the main Power Star in this galaxy. The Buoy Base is the main part of the Buoy Base Galaxy that consists of a large pool of water and an area above it which contains many obstacles, including Topmen, Thwomps, and Amps. The main objective of this part of the planet is to collect five blue Star Chips to form a Pull Star leading to a sphere planet filled with water. Submerged in the large pool of water at the bottom of the planet are multiple Bill Blasters and Torpedo Teds. A secret caged Warp Pipe in the pool of water leads to the underside of the planet, where more Bill Blasters and a cage containing a Green Power Star can be found. The Water Sphere Planet is a giant sphere filled with water above the Buoy Base. It has a screw on it that Mario must Star Spin to open the planet and retrieve a power star inside of it and also two pulse-wave generating machines, one of which is actually the screw. It is remarkably small in comparison to the Buoy Base and is similar (or a possible reference) to a Poké Ball from the Pokémon franchise. This mission's objective is to reach the top of the fortress. This mission's objective is to find the Green Power Star. The second mission in the Space Storm Galaxy in Super Mario Galaxy 2 appears to be partially based on the first mission in the Buoy Base Galaxy, even utilizing the same background music and a similar-looking tower, which features many of the same obstacles and enemies, such as Thwomps and Amps, and has an overall similar appearance (excluding of course the wide portion towards the bottom of the tower on the Topman Tower Planet). Buoy Base is one of two galaxies (the other one being Gateway Galaxy) that feature two Power Stars to collect. Buoy Base has a unused low poly version that shows much more islands and content under the level. The low poly version indicates it was originally going to be part of a much larger galaxy. A remix of the Buoy Base Galaxy's music appears as one of the selectable songs that can be played in events in Mario & Sonic at the Sochi 2014 Olympic Winter Games. This page was last edited on April 5, 2019, at 14:30.